Home IOT IoT Solutions Developed for Dairy logistic Supply Chain lures Smooth flow. The prompt equipments designed an IoT solution for one of the popular Dairy Industry-Amul that can help in improving and managing the dairy logistic supply chain. Popularly recognized as Amul Logistics App in between crowd, this IOT based App has already backed the dairy industry with its superior features. Well, people unaware of this significant app might be interested to know the story of this logistic app and how it assisted in advancing the milk industry. Anand Milk Union Limited, i.e., AMUL Company approached the prompt softech with a list of problems which has been obligating the development and management of the milk industry. The prompt equipments resolved the number of issues by developing an IoT based logistic mobile application. The logistic app can digitize monitoring of truck sheets and can track the transporters' real-time. It can help in managing truck allocation while maintaining data. It provides unambiguous reports which can assist in improving business. The application accumulates images along with data to prohibit any error. Features which makes IoT logistic app different from other apps! The mobile application is first of all effortless to use. The excellent features added in it provides real-time data. It keeps an eye on the route taken by the transporters. The logistic app can plan the road map to be followed depending on the Union rule as well as shifts. It can store images and trace the kilometers covered by the transporter. The IoT solution is even capable of generating accurate reports following the SAP Format7. It can also draft a tanker Capacity Usage Plan. The application holds a grip on the complete management system by monitoring through captured images, evaluation of data (VDCS Collection vs. Tanker Collection). The logistic application, appreciated by the milk industry offers Dipstick Chart Option and Real-time Route Divert Option. The Milk industry appreciated the efforts of the prompt equipments and felicitated with an appreciation certificate. Being a part of the dairy industry can be stressful, maintaining data from initials to the end is indeed not an easy task. 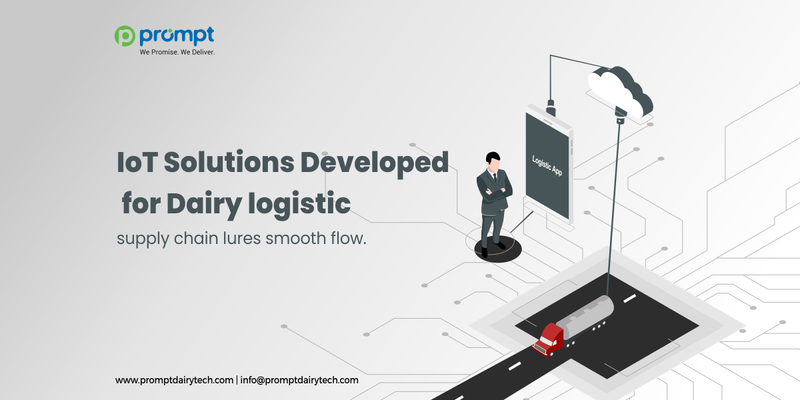 If you are cruising on the same problems, then check out this fantastic logistic application that caters end-to-end dairy technology solutions and assures stable functioning. Share your views and experiences in the comment box. Know more about Logistic Application which is developed to help you for generating uniform transportation functioning.